And here in Maryland, being stuck just north of the Carolina styles and just east of the Tennessee and Memphis/KC styles, there is a contingent that loves either the really sweet stuff (hello Sweet Baby Ray’s), or the thinner vinegar based style (Bone Suckin’ or Sticky Fingers). Of course I can’t speak for all of Maryland, there has to be some mustard based sauce lovers, as well as the simple Texas style sauces. But we live less than a mile from the Mason-Dixon line and have our own preferences. 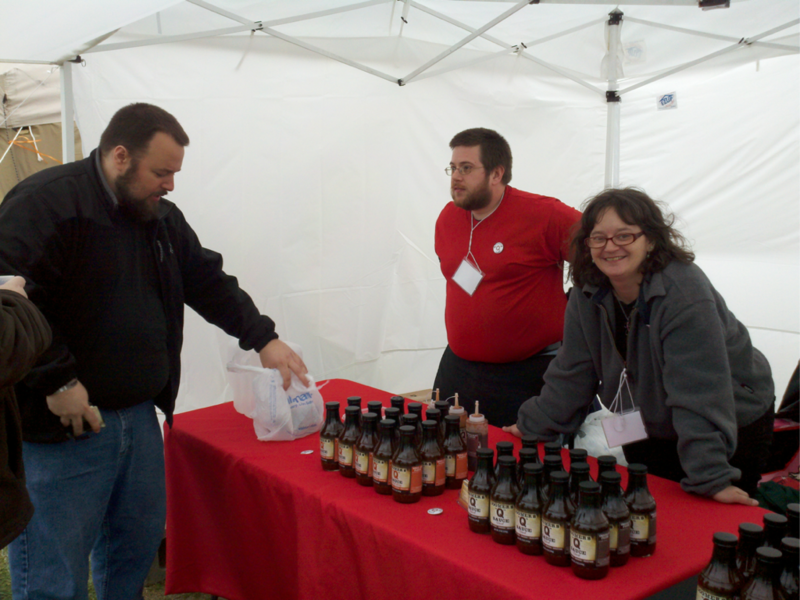 We met Todd and Jo of Doomer’s Q at Pork in the Park 2011, and were blown away by the quality of taste and diversity of their sauces. 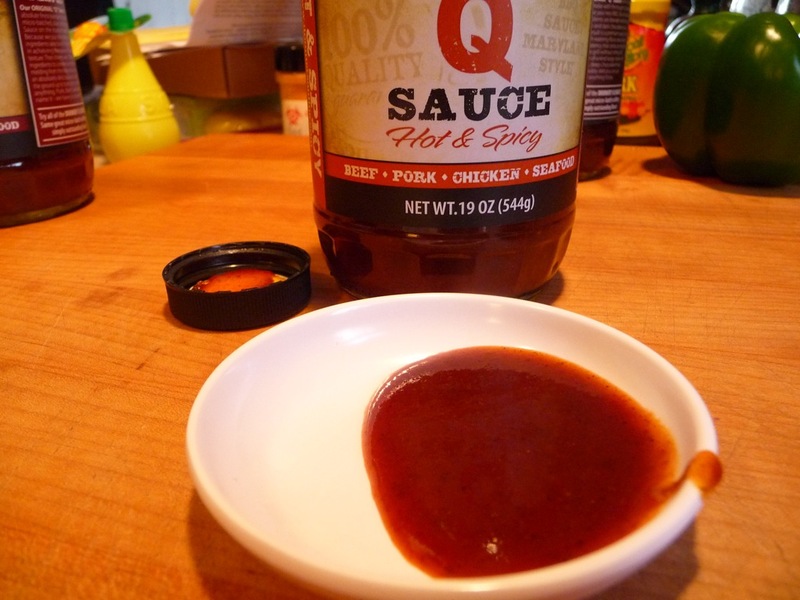 Delightfully zesty yet true to BBQ form, it’s a delicious, savory, medium-bodied sauce that stands up to beef and complements chicken and shrimp very well. Building on the solid foundation of their Original, the Hot & Spicy brings on the heat. I get a 2 out of 5 peppers of heat level… which is fine for me, as I like just a hint of heat in my hot/spicy BBQ sauces. 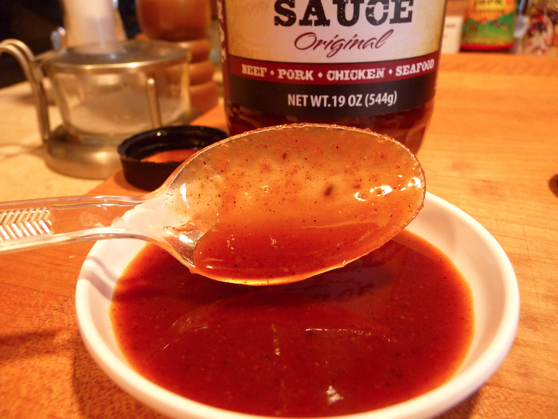 This sauce can light you up gently, but it mellows with cooking. Our chicken tenders were mildly spicy – not too hot, but just hot enough. Here’s the “dark horse” of the lineup… (ouch! sorry for that bad pun). I was initially turned off by the inclusion of dark chocolate syrup – but after just one reluctant taste, I was sold. You have to try it to appreciate it. It is remarkably delicious and oh so very unique…. 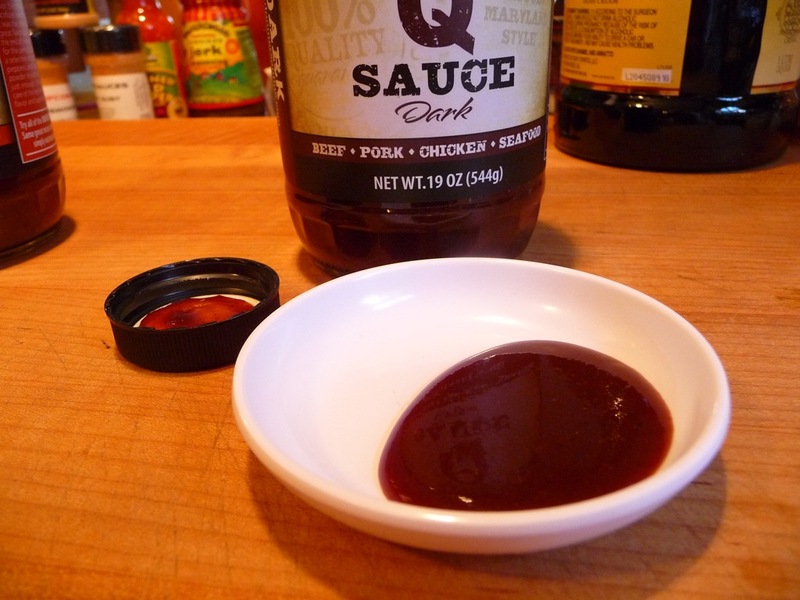 I did NOT taste the chocolate as a single flavor; rather it added a warm earthy component in a medium-thin sauce that just may change your mind about “dark” bbq sauces. Excellent! 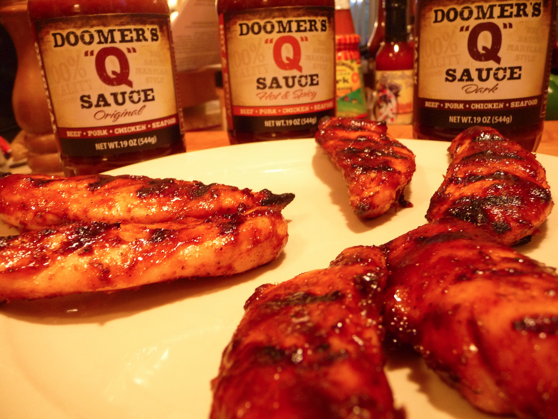 In summary, I am proud to announce, as a Marylander, that Doomer’s Q Sauces have truly captured the essence of what a Maryland BBQ Sauce should be – and you should capture a few bottles of this new hand-crafted BBQ sauce that is so different and unique in flavor. These sauces just may be your next secret ingredient to satisfy your friends or impress the judges. We cooked some chicken tenders with all three sauces, and none of them disappointed us! 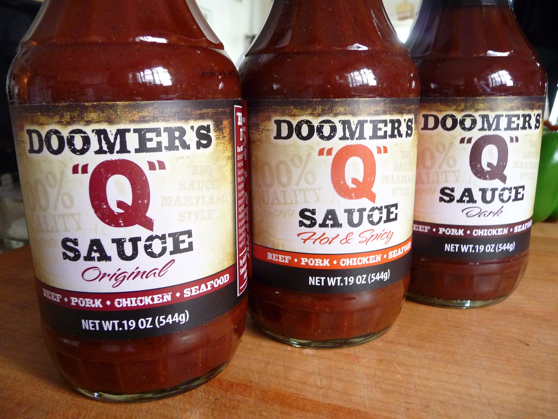 Visit Doomersonline.com to order and find out more about Doomer’s Q from Maryland and tell them HotSauceDaily.com sent you. And be sure to check out our interview with Todd and Jo on episode 39 of HotSauceWeekly! See Part 2 here: Part 2 about Red Brothers here. Hey Brian! Just got a 4th of July Recipe posted by Doomer’s on my blog! Thanks for introducing me to their great sauce! They really have some awesome sauces. Thanks Kevin for the feedback. Way to go Todd and Jo! Thanks guys! Jo and I appreciate the love and support! Awesome sauces, Todd and Jo! Rock on! Is the dark reminiscent of a mole style sauce or entirely different? The sauces look like they have a good body to them. Chris, the only mole I’ve ever had was SOOO intensely chocolate that I never ordered it again. The flavor of Doomer’s Dark brings only an undertone of the dark chocolate syrup, which I think results in developing the “umami” aspect of the sauce. Not many BBQ sauces accomplish that, in my opinion. where can i get this bbq sauce. i grew up on this stuff 2 to 3 times a week love it. how much is it.